Two years ago I attended my first Ladies that UX event. I had left work early and felt pretty nervous going to an event where I would not know anyone or even really know the subject. Should I really be attending as I was not a UXer? But there was no need to have worried. I was given a warm welcome and found myself surrounded by people who understood my journey and would support me if they could. The November event is my favourite, not just because it was my first but because it is always the most inspiring. The first two were called Finding Your Voice, but this year it had been changed slightly to Finding Your Leadership Style. However we still had a panel of motivational ladies to speak on the subject which covered everything from what does leadership mean right through to how to resolve issues in the ranks. 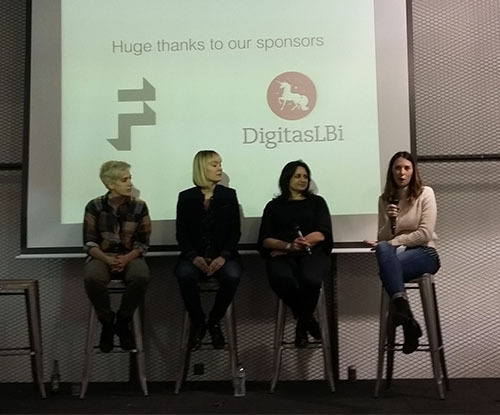 Speaking were Caroline Austen from Aldermore Bank, Rakhi Rajani from Travelex and Hayley Sudbury from WERKIN, all chaired by Amy Shore from Foolproof. They started by speaking about what it means to be a leader. Although there were many parts to the answer what it boiled down to was tapping into your passion and using it to inspire others to take action. They then spoke about leadership style. Here they suggested that you have to find an environment where you can truly be yourself. And reminded us that you do not have to be a massive personality to be a good leader. Is it possible to inspire others and still progress yourself? They answered not only yes, but that if you are passionate about what you are doing you will be able to inspire others too. But you must not forget you also have a responsibility to your people. The evening was full of good advice, including making sure you listen; be honest with yourself; treat others as you would expect to be treated but do not let that stop you from holding your ground; and you do not have to lead a team to be a leader. I always come away from these events feeling inspired and hopeful that if I ever get to the point in my career where I am leading a team, that I will be able to put all this into practice and not be the bad leader we have all experienced. But the best take away was from Hayley who said "you'll never know all the answers. It's the way you approach finding out which is important."